Tactical RPGs like Dungeons and Dragons , Savage Worlds , and the AGE family of games (Blue Rose , Dragon Age , and the upcoming The Expanse  RPG) offer an experience completely unlike more story-based games. While they can certainly contain any amount of intrigue, tense character moments, and plots as rich as any story-focused game, these titles tend to focus on individual encounters or situations more as challenges to be overcome through a combination of die rolls and player choices, using a relatively-constrained set of agreed-upon rules. Though this type of play is sometimes derided as “roll-playing” rather than “role-playing,” these rules can help create a sense of verisimilitude and immersion, as everyone has a shared understanding of how their skills and choices relate to what is possible, impossible, and extremely risky in the world the characters occupy. The rules help carry some of the weight of world-building and decision-making, and can lead to some truly unexpected, unforgettable game moments. While I love story-based games, my heart will always belong to games that fully flower with elaborate maps and miniatures that draw the whole table in. Because these games reward a fuller understanding of these rules more than less-tactical options, players and GMs who have mastered these systems tend to prefer to stick with them, and can sometimes be resistant to trying out other games or other play styles. More often than not (and more often than we’d like to admit) that means that the overwhelming majority of challenges any given group is likely to encounter are either resolved with either relatively little interaction with the rules or with combat. There’s nothing necessarily wrong with that approach to gaming; if you and your players have already found the right combination of rules, variety, and challenge, you probably don’t need this article (or any other) to tell you how to have fun; you have, in fact, figured out how to win at RPGs. …if you and your players have already found the right combination of rules, variety, and challenge, you probably don’t need this article (or any other) to tell you how to have fun; you have, in fact, figured out how to win at RPGs. If, on the other hand, you find yourself as a GM or player wondering whether you can make a rules-adjudicated encounter varied, unexpected, and interesting in ways other than “hit them until they run out of HP (or Wounds or Fortune),” then maybe it’s worth looking into (drumroll please) An Elementary Alternative to Combat . The preceding article  in this series covered some ways that natural disasters (specifically, fire and water) can use movement, combat, and health rules to face challenges that can’t be defeated with violence or clever words. Continuing in that vein, and because Captain Planet had way, way more of an influence on my upbringing than it probably should have, this article will give you a few tools for making use of air (tornadoes) and earth (earthquakes) as challenges for your group to overcome. As with the previous article in this series, it’s important to highlight that these are real natural disasters that players in your group may already have experiences with. Make sure that these are topics your group will be able to enjoy. Additionally, none of this is intended to minimize the real human cost of these events. If you or your group find yourselves thinking about how awful these events are for the characters in your world, consider throwing a few dollars at the charities called out in these sections. If you can afford to, it’s surprisingly easy to help make the world a better place . It may surprise you to learn that tornadoes do more than drop houses on nuisance siblings. Tornadoes can last for more than an hour, but generally (in the real world) last less than ten minutes. Though they are very small when compared to the scale of other types of weather, with winds that can reach up to 300 miles per hour (~483 kph) or more, they can easily destroy every every structure in their path. A truly realistic depiction of heroes trying to survive a tornado probably wouldn’t be all that interesting; just by themselves, winds are destructive enough, but when you factor in debris, collapsing buildings, and other hazards that occur when basically everything becomes airborne, “realistic” rules for making it through a tornado outside of a shelter would probably be more like “save vs. death” than “a tactically interesting situation. However, in the fine tradition of Dorothy Gale’s tornado-proof farmhouse  and Indiana Jones’ radiation-proof refrigerator , we can move forward with the understanding that sometimes bad science can make good stories. In worlds with elven wizards, alien cyborgs, and time-traveling sapient dinosaurs, it’s not like that’s likely to be the biggest stretch in your game. With that in mind, some considerations in having your characters survive tornadoes. Clearly identify the shelter they should be running toward–this can be a well-protected basement, a solid cave structure, or an area warded with magic or superscience. Clearly map out the characters’ location, the location of their “goal,” and “safe shelter.” The ideal “safe shelter” should be approximately three full turns of movement away from the furthest player–the “goal” should be about the same distance from both the furthest player and the shelter. Place some debris on the map to complicate your characters’ lives. These can be anything from flying shovels to building parts to unfortunate and confused livestock. Depending on the size of the map, you’ll want to have approximately one piece of debris for every 20 feet of map space along its longest dimension. While the encounter is ongoing, this debris will be flying around the map, potentially colliding with players. Larger debris will move slower, but do more damage when it hits. Smaller debris can whip all around the map, but is less likely to be devastating. Large Debris: things like mostly-intact buildings, huge wooden statues, or ships fall into the category of “large debris.” When this debris collides with a player, it should have the potential to completely wipe out the character in the party with the highest health resource–depending on the system you’re using and the level of your characters, 10d10 damage or more is not unreasonable. However, your characters will be glad that this type of object moves relatively slowly. Damage: 100% of full health of the beefiest character. Medium Debris: cows, doors, and heavy furniture can all be considered “medium debris.” Though these don’t pack quite the whallop of very large debris, they should still be able to take out 50% of the full health resource total of your most resilient character, and they move much faster. Damage: 50% of full health of the beefiest character. Damage: 25% of full health of the beefiest character. Have the players roll initiative, just like a regular combat, but have the tornado “act” like a combatant in the middle of the players (so, for example, your initiative order could go something like: Alex, RJ, TORNADO, Omar, Padma). An 8-sided die to determine the direction of the wind, with one being north, then northeast, east, southeast, south, southwest, west, and finally northwest at eight. A 6-sided die to determine the strength of the wind. 1-2: Very Strong—All players’ movement speed against the wind is halved, and doubled moving with the wind. Players moving diagonal to the wind move at 3/4 speed (rounding down). Any debris encountered during this round does 1.5X damage. All debris has 30 feet added to its movement speed. 3-4: Strong—All players’ movement speed against the wind is 3/4 (round down). Players moving diagonal to the wind move at full speed. Any debris encountered during this round does normal damage. All debris moves at standard speed. 5-6: Lull in the storm—Though the winds are strong, players’ movement speeds are unaffected in any direction. All debris moves at half speed, and all debris does half-damage. Players and NPCs move as normal except as noted above. Note that, depending on the method of flight, flying characters may have more trouble moving in high wind than characters who are stuck on the ground. During the tornado’s turn, all debris moves in the direction of the wind, determined by wind speed. If a piece of debris would be taken off the map, move it to the opposite side of the map and continue in the same direction. If debris collides (somehow) during the turn, the smaller piece of debris is moved one size category down. Small debris is just destroyed. If the debris is the same size, both pieces move one size category down. The encounter ends when the players reach safety. It’s tempting to continue past that point (take the temperature of your table to see if they are interested in doing so), but keeping this encounter as a bounded activity helps prevent players from feeling like the goalposts have been moved. Ancient structures can be uncovered and encroach on existing ones. Floors can be rearranged, destroyed, or rendered inaccessible. 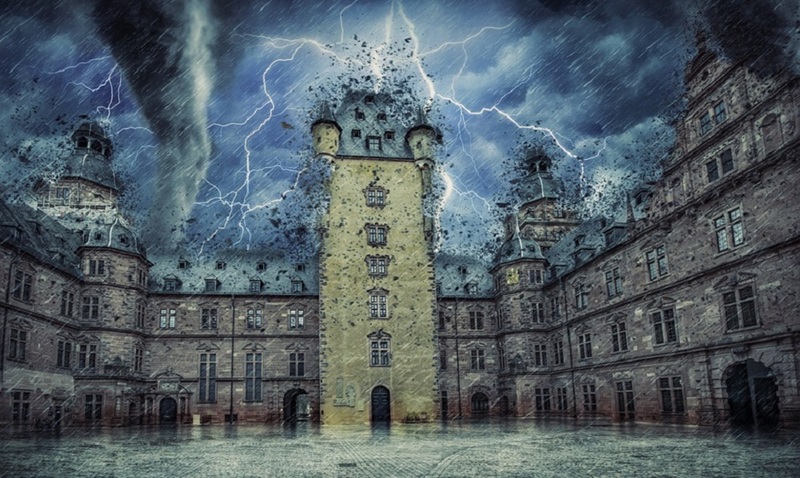 An earthquake can be an excellent way to create or resolve a “locked door” mystery. Players trapped in a newly-enclosed area (or rescuing someone in a newly-enclosed area) must race against time as air, food, or water run out. Aftershocks can make getting out of a dungeon, castle, or forest as confusing as exploring the area in the first place. Buildings can have structural damage, making floors or walls dangerous to use or even be near. Liquefaction can briefly turn otherwise-solid ground into a soupy mess as groundwater is agitated into areas it hasn’t been before. This can sink needed resources (forcing characters to excavate) or surface new and interesting developments. Player characters are (usually) powerful, and their power to affect the world is part of what draws us to them. There’s something satisfying about the fantasy of seeing something wrong and being able to fix it. But every once in a while, players should encounter something their sword can’t conquer, and the exercise of learning how to use the power, ingenuity and strategy they’ve always used to beat the baddies for another purpose can be a breath of fresh air, or fire, or earth, or water. …every once in a while, players should encounter something their sword can’t conquer, and the exercise of learning how to use the power, ingenuity and strategy they’ve always used to beat the baddies for another purpose can be a breath of fresh air, or fire, or earth, or water. Do you have any go-to non-combat challenges you use in your games? If so, tell us about them so we can use them in ours!